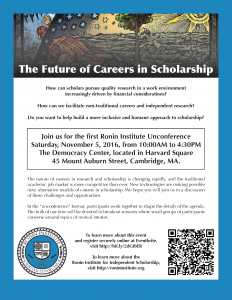 The first Ronin Institute Unconference, on the Future of Careers in Scholarship, is coming up soon. It is being held on Saturday, November 5, in Cambridge, MA. Sponsorships are now available for this unconference. If your organization is interested in sponsoring this event, you can find more information at http://ronininstitute.org/events/sponsorships/, or you can contact us at development@ronininstitute.org.